Being the children of someone that used to work at The Natural History Museum, my kids have dinosaurs in their blood. Their first toys were dinosaurs and they have been fossil hunting since they could toddle about. However, my library of dinosaur fact books suitable for primary school aged children has until now amounted to a Ladybird book I had when I was six. It’s quite a challenge finding books which have the right mixture of information, illustrations without being overwhelming. We were sent these two books to have a look at as a response to a request I made to a book publisher and I’m thrilled to have been sent them because otherwise I wouldn’t have found them. This book gets 5/5 from us for helping the children to think about the characteristics of different dinosaurs. Incidentally it also as a result fits in perfectly with what my son is currently covering in Year 1 this term which is themed dinosaurs. You open each page of the book and you get a quarter of a picture of a dinosaur and a sentence to explain the characteristics you can see. As you unfold the pages you can discover more about each dinosaur. It’s a very simple book, with very kid friendly illustrations but is ideal for the 3-5 year old age group its aimed at. I like it a lot and shall recommend it to my sons teacher. Especially as it is such a compelling book for children, mine certainly can’t help themselves but to read on, which is a good thing. 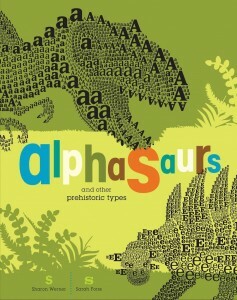 I love a bit of typography and as the kids are busy learning about phonics AND dinosaurs this is a perfect book. Each dinosaur is illustrated using the first letter of its name. It really is a genius idea. A Veloceraptor drawn entirely using the letter V for example. The children really enjoyed the cut out pages which you use to open up the pages to see each dinosaur. 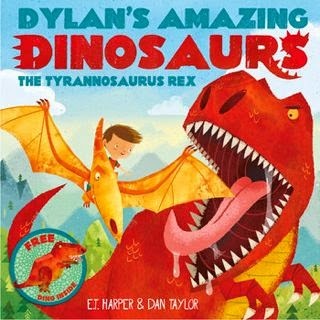 You’ll love this book if your kids are dinosaur mad, but also if you like good quality, nicely printed and presented books. As such it’s also perfect if you are looking for an original gift.